Product prices and availability are accurate as of 2019-04-14 04:23:19 UTC and are subject to change. Any price and availability information displayed on http://www.amazon.com/ at the time of purchase will apply to the purchase of this product. Organic Eucalyptus Globulus is an essential oil that is very familiar to the world of oils and is used often. Its strong, aromatic scent makes this a favorite one to use for respiratory support. Organic Eucalyptus Globulus has a very herbaceous scent with soft woody undertones. Originating in India and steam distilled from the leaves of the Eucalyptus tree, Organic Eucalyptus Globulus is 100% pure with no fillers or additives and is an essential oil that is a great asset to have on hand. Blends well with Basil, Cajeput, Cedarwood, Citronella, Frankincense, Ginger, Lavender, Lemon, Spearmint and Tea Tree. Whether it is being used to support aching muscles, promoting a healthy circulation, or stimulating mental focus, this is an oil that is powerful and effective. 100% PURE USDA CERTIFIED ORGANIC EUCALYPTUS ESSENTIAL OIL: Steam distilled from the leaves of the Eucalyptus plant to produce a high-quality essential oil that is with absolutely no additives or fillers. SUPPORT RESPIRATORY HEALTH: DIffuse Organic Eucalyptus Globulus and Organic Frankincense into the air to help support clear breathing. 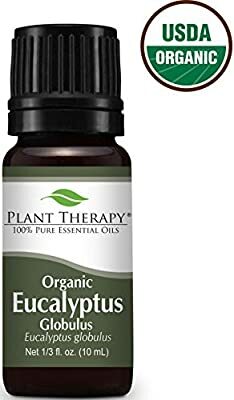 EASY TO USE: To ease muscle tenderness massage a blend of Organic Eucalyptus Globulus with your favorite Plant Therapy carrier oil with a 1-3% dilution in a circular motion in the targeted areas. BATCH SPECIFIC GCMS: Every bottle of oil that you purchase from Plant Therapy goes through multiple rounds of testing including organoleptic testing by Robert Tisserand and multiple rounds of GCMS testing by several third-party laboratories. Look for the specific batch code on your bottle! HAVE QUESTIONS? : Plant Therapy's certified aromatherapists are happy to help you with your USDA Certified Organic Eucalyptus Essential Oil questions via Amazon Messages. We welcome your questions and input!